In this portion Moses alerts the heads of the tribes about the commandments connected to the making and untying of vows. The portion also speaks of Pinhas, who leads Israel into a war with Midian and emerges triumphant. Following the war, the text details the division of the spoils (some of which are dedicated to the Creator) as well as the commandments to make the Kelim Kosher, detailing the process of dipping and immersing them in boiling water. At the end of the portion, the tribes of Gad and Reuben ask to stay on the Eastern bank of the Jordan River because of its good soil for their voluminous cattle herds. They infuriate Moses because he thinks they are seeking to avoid the war for the conquest of the land. In the end they commit to participating in the war and Moses grants their wish for a lot outside the land of Israel. Kabbalists attain the forces and discernments of the spiritual world. These are the forces that operate and manage our world, including the still, vegetative, animate, and human, each of which has a force that runs it. This is why it is impossible to ask anything of people who are not Kabbalists, as they have no free choice, as it is written, “They are all as beasts (animals).” When we read a story in the Torah that seems to be happening in this world, we need to understand that its roots are in the spiritual world, in the network of forces that governs the world. Today we already feel and understand that we are approaching the network of the forces of the integral nature, which closes in on us and compels us to behave accordingly. It is the appearance of Godliness, which is gradually nearing us. We see that we can no longer manage the world. Each day we are feeling more and more clearly that nothing in the world depends on us. We are losing our ability to manage the world because we can no longer act in life using our egos. Kabbalists discovered the upper network and told us how it manifests on the upper level. They did so using words and stories of this world, our world, because everything that exists in the upper one descends to the lower one. During the forty years in the desert, and even before, Moses wrote his five books, the Pentateuch. Through his attainment, Moses wrote part of the Pentateuch about the times preceding his own. He wrote it in the language of the branches, in the connections between upper and lower. Moses wrote about everything that takes place in the upper world and how the forces are managed. He spoke of them as results, as “marionettes” that move about our world and change. This is why it is pointless trying to deal with this world; it is utterly governed; there is nothing in it of its own. To know everything, we need to rise to the upper degree, the place where decisions are made, where forces operate and influence our world. We cannot change anything in this world, and we are well aware of it. Yet, there is one way by which we can change. If that happens, a person can be in bestowal and love according to one’s nearing to the forces in one’s nature. In this way one can change one’s fate here in this world. In fact, only by changing ourselves can we achieve, “I have created the evil inclination, I have created for it the Torah as a spice,” because “The light in it reforms them.” Only through the light that we draw from the study of the wisdom of Kabbalah can we change ourselves and rise to the upper degree. From that upper degree we can influence the decisions and the mechanism that operate our world. This is why Moses turned to the heads of the tribes and explained to them about untying the vows, about going against Midian, etc. We need to imagine man as a small world, and everything that happens in the world as happening within. Indeed, within us are Moses and the entire structure called “the people of Israel,” with its priests, Levites, and Israel, being the three lines that comprise our soul. There are also the nations of the world within us, the Midianites, Pharaoh, and everything else that the Torah narrates. When we discover ourselves and detect within us all those forces and qualities, we perceive the Torah as an instruction. Accordingly, we act to change and adapt ourselves from a person in this world to a higher, spiritual human, aware of the spiritual world, at the spiritual degree known as Matot (tribes). This is a very high degree, working out of Hesed, the highest Sefira (singular of Sefirot) of the structure of the soul. Out of the ten Sefirot, Keter, Hochma, and Bina are the top Sefirot. They are above our attainment and are the ones that manage us. We approach them through our inner qualities, through arranging them properly as Hesed, Gevura, Tifferet, Netzah, Hod, Yesod, and Malchut, which are the seven remaining Sefirot. We correct these seven Sefirot repeatedly on each degree, and they are called “the seven days of the week.” Hesed, Gevura, Tifferet, Netzah, Hod, and Yesod correspond to the weekdays, and Malchut corresponds to the Sabbath. By correcting them we go through the weeks in a circle that eventually brings us to Keter, Hochma and Bina, the top three Sefirot, meaning to the end of correction. Each week in the year has its Torah portion or portions. These are degrees by which we gradually elevate ourselves to the top degree, by opening up to our interior. As we do that, we find the forces within us and act alongside them. The quality of Moses in us turns to the heads of the tribes in us, according to the division of the soul into twelve tribes, the tribes he arranged correctly while working with the growing ego from a state called “reception of the Torah” to a state called “entrance to the land of Israel.” The process one undergoes between the states is called “the forty years in the desert.” The desert represents our need to sort out the desires within us and correct them from reception for ourselves into the altruistic form of bestowal, to the right approach toward others, which can be summed up in the maxim, “That which you hate, do not do to your friend.” On the degree of “tribes,” one scrutinizes one’s qualities and how to work with the will to receive. At first, a person can scrutinize the vows. Vows are states and conditions by which one attains a higher degree. The vows indicate the limitation one can take upon oneself and not fail. However, when one cannot persist with them, it is possible to rid oneself from them much like the untying of vows before Yom Kippur (Day of Atonement). There are fundamental laws in spirituality that concern man and the scrutiny that takes place within—to what extent one can ask for correction for oneself and work with the force that corrects. Following these preparations, a person becomes aware of one’s ability to work with one’s ego on the level of Midian. Such a person works with the force known as Pinhas, which is the next stage of the force of Moses. This is when one can truly go to war. A person goes against one’s ego in order to conquer it and works with part of it in order to bestow. We ascend to a spiritual degree by correcting the evil inclination into a good inclination. There is no other substance but our own—the will to receive. First, it comes with only the intention to receive. At that point it is called “the evil inclination” because it prevents itself from participating with others. When it turns into the good inclination, it connects to everyone. This means that a person has succeeded in the war and has conquered the ego. Once a person has conquered one’s ego, he gives spoils to the tribes, the priest, the Levite, Israel, the women, and the children. He gives spoils from everything he could take from the still, vegetative, animate, and the speaking degree (human). The Torah details what we must do with the masculine part, which is the right side of the Klipa (shell/peel), and what we need to do with the feminine part, the left side of the Klipa. On Yom Kippur there is a custom to untie vows. Why then is there a need for vows in the first place? There are also complementary actions such as the Second Passover where if we did not prepare ourselves for the correction known as Passover, where we “pass over” the ego, we can come to it a month later. This sounds like a negotiation. We make vows so we can complete the work later, that if we do something we will receive so and so. No, there is no such thing. It is not how spirituality works. A person does everything honestly until one discovers that it is impossible to keep moving forward, or that the conditions have changed. We are in a system of interconnected souls that supports us when we fall. We learn about our being in an integral system from Moses, who did nothing wrong except for the striking of the rock, yet the whole nation suffered because of it. There was only one Moses, but we are just beginners. There is nothing to say about this world. Here we are nothing more than outcomes of the spiritual world. If we can influence the spiritual world through the study of Kabbalah we will change this world, as well. If we do not, we will change nothing. In fact, we can impact the spiritual world just by aspiring to ascend to spirituality, and this will impact this world favorably. If we have no ability or desire to change our spiritual situation even if we can, our world will still advance, but on a path of suffering. How can we change our world if it is only a world of results and we are being operated on, without any free choice? As soon as we begin to ascend toward the spiritual world, we begin to change this world. Nothing in this world changes it but the forces that influence it from above. Therefore, our only choice in this world is to rise above it. Is this done by connecting and uniting with others? Yes, through unity with others. Will we improve our financial situation, too, by studying Kabbalah? Everything will change. All the outcomes in this world depend only on the connections between us. There is nothing truly worth doing but securing our sustenance, and dedicating the rest of the time to spiritual ascension. This, in turn, will change everything. Is the correction personal or does it affect everyone? The correction is both personal and general, but today it is primarily general. Why is it so hard to understand it even though it sounds so simple? We are built according to our individualistic egos. We view the world egotistically. And precisely because of it, today the systems of economy and education are becoming dysfunctional. We cannot succeed anymore because everything is broken and scattered. Throughout history we have become used to advancing using our egos, by trying to profit and benefit ourselves the most. But today these egotistical, linear systems have stopped functioning. We are moving into systems that are round, integral, connected. Is the reciprocal impact sensed immediately? Yes, people will feel more important, more successful, and even stronger than the government. Governments act egotistically, like a linear arrow. Conversely, the connections between people are circular. Today we are in a global mechanism in a nature that is integral and global. As a result, we cannot continue to advance egotistically, linearly, as before. Now we have to learn how to ascend, how to increase the aim to connect “as one man with one heart,” because only through unity can we change the way things are. The spoil is a result of man’s work with the evil inclination. In this war, a person turns the evil inclination into good inclination using the light that reforms. As a result, a person receives light through that inclination. The light that fills a person—the attainment, that sublime sensation—is a great possession. This is the spoil. The division of the spoil refers to how one divides the light among all of one’s parts, all of one’s desires and qualities. It denotes how one operates that division mechanism, who receives more, and who receives less. This portion seems to discuss the root of the conduct of making utensils kosher. The root of the matter is in our Kelim (vessels), the will to receive. This is where we receive the light. The light may appear in our desires on condition that they are not working only in order to receive, but also in order to bestow—to share them with others. When we connect ourselves to others in this way, the light appears in us. It follows that all our corrections are really qualifications of our Kelim, making them kosher. Put differently, we need to qualify our will to receive so it aims to bestow, so it is connected to others. The water, which represents Hesed, qualifies the Kelim. If we need to correct a metal Kli (singular of Kelim), meaning make it kosher, it requires a deeper correction. It has to be passed through fire, representing Gevura. A metal Kli represents a desire that was used egotistically and that must be corrected and cleaned more powerfully through “whitening” (heating to the point where the metal becomes white), Mikveh Kelim (a tub used for ritual immersion of utensils), and Hagaalah (dipping in boiling water). 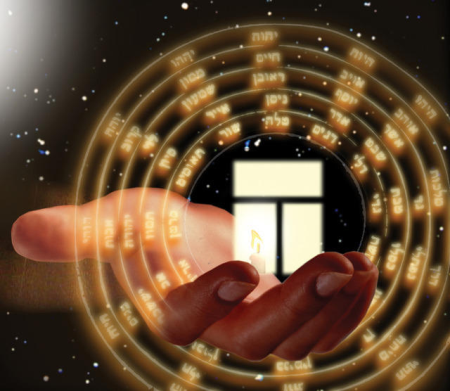 Correcting our Kelim is all that we have in the wisdom of Kabbalah. The correction of the Kelim takes place once a person has acquired them and has shifted them from the aim to receive into the aim to bestow, having conquered one’s desires. This is not only about correcting Kelim in the sense of utensils, or dishes, but about correcting the Kelim when one makes offerings. The offering is a Kli on the animate level. One “kills” one’s will to receive, meaning the manner in which the will to receive was used before, egotistically, and brings it as an offering (Korban), from the word Hitkarvut (nearing), toward bestowal, in favor of others. Only then can one bestow love upon others using that same will to receive, which then becomes holy. This is not the only Torah portion where there are wars and struggles. We are always at war, always struggling, until we reach the end of correction. If a person has already attained a certain degree and enjoys the light in it, why should one relinquish it? Because that person would want to pass it on to others. But that person still has no desire to pass the light to others. Wanting to pass it on is a precondition for receiving the light. You mean, in order to receive the light, you first need to want to give it away? Of course. We already want to receive it because we heard it is good. But we will not receive it until we desire to share it with others. Our world mandates that we become connected because we are approaching the end of the correction process. Once a person has tasted the light, what would stop one from wanting it all the time? We advance “on two legs.” One receives Kelim, corrects them, fills them with light, shares them with everyone, and thus does a very good deed, a Mitzva (good deed/commandment). Using the will to receive in favor of others is called a Mitzva. Once a Mitzva is done, another part of the person’s ego that was hidden inside rises and appears. Eventually, the entire “Egypt” of a person appears, and one is now immersed in an ego that is spreading over the good. The bad suddenly becomes dominant over the good. When that happens a person becomes wicked, and the struggle begins anew: the previous degree disappears inside, “drowning” in the bad. When Israel enter Canaan and conquer it, there is the Eastern side of the Jordan river. Gad and Reuben wanted that lot. Why did Moses suddenly object to their dwelling on the Eastern bank of the Jordan? Our will to receive is in the three worlds Beria, Yetzira, and Assiya. There is also the Temple, Jerusalem, Mount Moriah, and the rest of the degrees: The land of Israel, around which is the Jordan, Lebanon, Syria, and Babylon. Additionally, there are the rest of the lands in the world, but they are not considered as having anything meaningful. The Eastern bank of the Jordan is the first boundary outside the land of Israel, and therefore does not have the same level of sanctity as the land of Israel itself. This is why Moses, the force that manages all the corrections within us, opposes the children of Israel’s presence there. All the children of Israel must first be inside the land of Israel, and only afterward are there the conquests of David, which include Lebanon, Syria, and Babylon, from the Niles to the Euphrates.